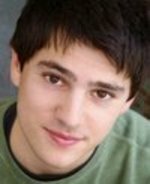 I found him in the IMDB listing for Election, where he's credited, oddly enough, as "Larry Fouch (as Nick D'Agosto)"
When I found his IMDB page, there was no mention of The Office on it, but I was still 100% sure that it was the same kid. Each of the over 50 times I've seen "Election", I've always wondered what happened to the kid at the end, the one who counts the votes and says earnestly and profoundly "It's a squeaker, Mr. M. I've got Tracy by a vote. Just one vote." I always thought he was really good in that part. ANYway at the bottom of his IMDB there was already a message board post saying "Credited in tonight's episode of "The Office" (and the show wasn't even over yet, I love the internet.) Anyway, the only point of this post is to come back later and say "Yeah, I was kind of the first person in the world to write about him? So, yeah." More Administrative Assistant Hunter next season, please!